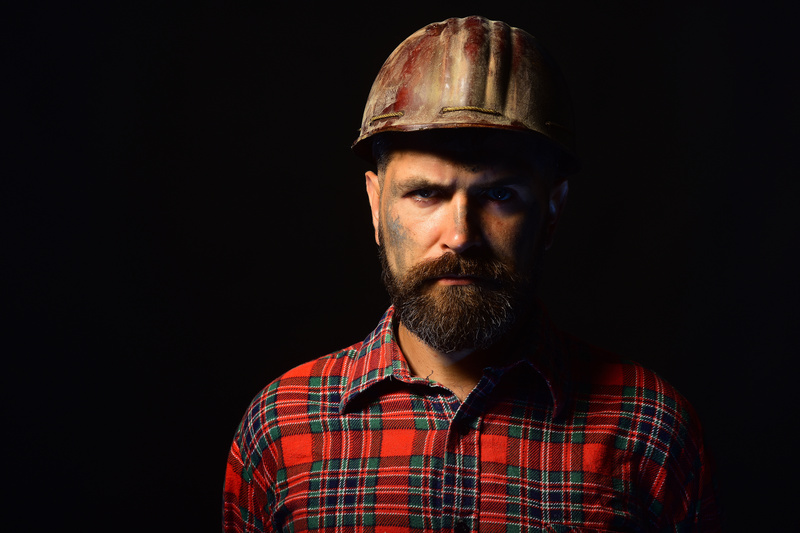 Builder or miner with thick beard. Worker with brutal image wears helmet and plaid shirt. Man with strict face expression isolated on black background, copy space. Labour and heavy industry concept. In this special edition: The rare earth elements have been in the news lately and we thought it would be good to discuss the background and current state of affairs in this matter, given the worldwide importance of these minerals in modern technology. This might also give you context as to why this is included in the computational model of the Singularity Index or S.I..
As detailed in Hobart M. King’s excellent article on geology.com, the uses for these materials span the gamut across industries in our modern world from aerospace to consumer electronics, defense to medical devices. Nearly every aspect of our modern society is reliant on these substances to some extent. Used in regular old-fashioned fuel-based vehicles for emissions control and electric or hybrid vehicles in the batteries, they are also used in the permanent magnets that are found in everything from the speakers in your electronics to the wind turbines that are increasingly being relied upon to provide a source of non-polluting power. They are an essential ingredient of much of the defense technology powering modern militaries and also the chips and other components in most of our modern electronics and medical devices. More uses are being found with regularity which virtually ensures that the world’s demand will only increase. Currently, one of the primary concerns is that one country, China, controls the bulk of the available world supply of these critical materials. While only controlling a bit over a third of the known available deposits, China has had the foresight to ensure that they are by far the dominant producer of rare earth elements and currently produce at least 90 percent of the minerals being mined. A decision by China, the number one consumer also, to cease exports of these minerals would effectively cripple the ability of industries in Japan and the United States, the next two largest consumers, to produce the goods they currently produce using these materials. As it takes a minimum of a few years for a mining company to develop a site and ramp up production, this situation seems unlikely to change any time soon. We note however that this seems like an unlikely scenario given that the bulk of China’s consumption is likely in the electronics they produce for export and that they would almost assuredly lose needed revenue both from the loss associated with the minerals themselves and the very probable decline in exports of the electronics as the rest of the world developed alternative supplies and products in response. We also note that although China is by far the dominant producer, they are not the only country in the world that produces these minerals. There are at least 7 other countries that currently produce supplies of these elements in not insignificant amounts; Australia and Russia being the next largest producers behind China. The leading Australian company, Lynas Corporation, has a Chinese company as its majority stakeholder as of 2009 and Chinese companies have also purchased other resources outside of China itself. Russia has been reported to be actively working to increase their domestic production capability. The United States, on the other hand, seems to have a bit of a split personality when it comes to this issue. In 2015, the only producing mine in the United States shut down due to a lack of profitability. In 2017, the mine was then auctioned off to a Chinese led consortium. This was then followed, in 2018, by an introduction of a bill to the United States Congress which outlined the need to ensure that there was a United States domestic supply of these critical minerals. Meanwhile, there is an effort to develop other sites within the United States and to develop new technologies, such as extracting these elements from coal waste, to ensure there is a domestic supply for their use. None of these efforts are expected to result in any significant production until at least 2020, however. In summary, while these elements are essential to our modern way of life and primarily controlled by a single country, it seems likely that fears of a restricted supply are a bit overblown and are mostly fearmongering. In the unlikely event that these fears were realized, it seems that the world would adjust and that our modern way of life would continue on; albeit with likely some slight increases in the prices of our beloved devices and gadgets. As always, thanks for listening; we hope you enjoyed this special episode of “The Technocracy”.